This surname in its various spelling forms, is surely one of the most unusual and interesting on record. It derives from the Old French word "Dague", meaning knife or dagger, and was a Norman introduction after the 1066 Conquest. The name is a medieval metonymic for one who habitually carried a dagger, or who was a manufacturer of such weapons. As the carrying of any arms was illegal, it is probable that the original ameholders, if not makers, were part of an official guard or even professional assassins, although this latter suggestion seems unlikely. 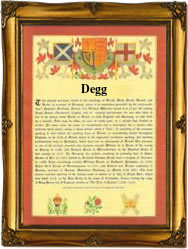 The name is found in a variety of spelling forms; the diminutive Daggett, meaning "little Dagg" or "son of Dagg", was prominent in Yorkshire, where it has been suggested that the name forms derive not from the French, but from the Norse-Viking "Dag", meaning "day", an early personal name. Examples of recordings of the surname include: Ralph Dagg, in the 1327 Essex Subsidy Rolls; Georgius Dag, of Yorkshire, in the Rolls of Henry 111; Jane Dege, christened at St. Matthew's, Friday Street, London, on May 5th 1538; and Geoffrey Degg, a witness at St. Botolph's Church, Bishopsgate, on October 6th 1616, whilst on May 5th 1618, Anna Dege married Laurence Bullas at St. Peter's Cathedral, Sheffield, Yorkshire. The first recorded spelling of the family name is shown to be that of Robert Dag, which was dated 1275, in the "Pipe Rolls of Worcestershire", during the reign of King Edward 1, known as "The Hammer of the Scots", 1272 - 1307. Surnames became necessary when governments introduced personal taxation. In England this was known as Poll Tax. Throughout the centuries, surnames in every country have continued to "develop" often leading to astonishing variants of the original spelling.